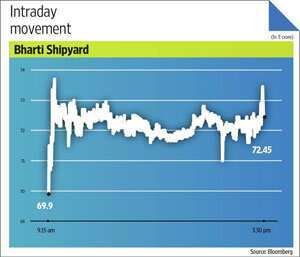 The Bharati Shipyard Ltd stock rose by 6% on Tuesday to ₹ 72.5 a share, on a day the market indices fell marginally. The shipbuilding company had on Monday, after market hours, announced that its board had approved a corporate debt restructuring (CDR) scheme. The board discussed the proposal for a restructuring of term/working capital debt of ₹ 2,854 crore out of a total debt of ₹ 3,250 crore, Bharati Shipyard said in a press statement. As on 30 September, Bharati Shipyard’s debt-to-equity ratio stood at 3.2:1. For the half-year ended September, interest expenses had almost doubled to ₹ 235 crore, adding pressure on profitability. For instance, Bharati Shipyard’s operating profit margin (including subsidy income) stood as high as about 35% for the half-year ended September. However, net profit margin (including subsidy income) came in as low as 4.5% for the same period. The company’s interest coverage or earnings before interest and tax divided by interest expense stood at a low 1.2 times for the first half of this fiscal. Needless to say, the corporate debt restructuring should offer some relief to Bharati Shipyard and that explains the jump in the company’s shares on Tuesday. So, does that mean all is hunky dory for Bharati Shipyard? Unfortunately, that does not seem to be the case. Shipbuilding companies are facing a weak operating environment and Bharati too is affected. Analysts, however, say Bharati Shipyard’s order book pending execution is quite low and are worried about it. 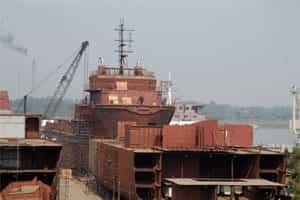 In its quarterly results update, ICICI Securities Ltd pointed out that Bharati Shipyard was left with just one quarter’s order book, which, if correct, is a cause for concern. The company’s ability to secure orders will be a key metric for investors to track in the days to come. For the September quarter, the company would have posted a net loss if it hadn’t been for the accounting of the subsidy income. Given all this, it’s not surprising that the stock has fallen by 66% in this calendar year so far.